I’m getting close to the end. I was looking at the photographs I still had available & I saw that it won’t last much longer than 1 week. 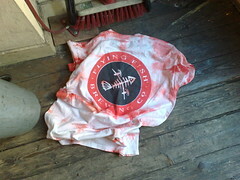 Time to show the last picture I made of a Flying Fish T-shirt. Last shirt I got also. A colleague of mine owed it, after getting it as a gift. He said he didn’t want to wear it, because he didn’t like the hippyness about it.